What makes this so difficult is just the following. Ocean surface temperatures appear to be excellent proxies for global climate. So are other measures. Except that they seem to have a mind of their own and seem to mock any effort to reconcile them. Such ocean heat should support a strong hurricane season. Yet 98 did nothing of the kind that I recall. Just when you suspect that there is some missing heat it shows up. The atmosphere moves a lot of heat around and picks it up from both the sun and back from the ocean. In fact the ocean is the earth’s heat sink and climate stabilizer. Anyway, we are back to not knowing squat that is particularly certain. The sea ice is continuing to erode and the northern land masses may not be as cold as they should be. And now the ocean is warmer than it should be. Yet we had a generally cool summer this year. It is as if we are getting selective applications of warmth that may add up to nothing consequential. After dealing this for two years, the only surety apparent is that our modeling is unreliable at best and should all be outright ignored. In fact, no one should be allowed to draw any conclusions that are deemed predictive. Does anyone think we are going to have a warm (cold) winter? 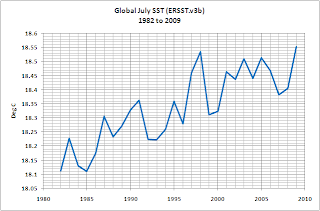 The June-August worldwide ocean surface temperature was also the warmest on record at 62.5 degrees F, 1.04 degrees F above the 20th century average of 61.5 degrees F.
The combined global land and ocean average surface temperature for the June-August season was 61.2 degrees F, which is the third warmest on record and 1.06 degrees F above the 20th century average of 60.1 degrees F.
The worldwide ocean surface temperature of 62.4 degrees F was the warmest on record for any August, and 1.03 degrees F above the 20th century average of 61.4 degrees F.
Separately, the global land surface temperature of 58.2 degrees F was 1.33 degrees F above the 20th century average of 56.9 degrees F, and ranked as the fourth warmest August on record. Large portions of the world’s land mass observed warmer-than-average temperatures in August. The warmest departures occurred across Australia, Europe, parts of the Middle East, northwestern Africa, and southern South America. Both Australia and New Zealand had their warmest August since their records began. The Southern Hemisphere average temperatures for land and ocean surface combined were the warmest on record for August. For the year to date, the combined global land and ocean surface temperature of 58.3 degrees F tied with 2003 for the fifth-warmest January-August period on record. This value is 0.99 degree F above the 20th century average. NSIDC data indicated Antarctic sea ice extent in August was 2.7 percent above the 1979-2000 average. This is consistent with the trend during recent decades of modest increases in August Antarctic sea ice extent. visualization of the world’s land and ocean surface temperature. visualization of the Arctic sea ice extent.